The East Bay Rats often frequented The Parkway, especially on 2 for 1 Wednesdays, and I spotted more than a few Hell's Angels at the the theater over the years. They always parked their bikes outside, though, per the law and all. Very respectful and polite. 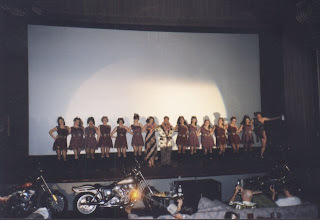 But on two separate occasions, I actually allowed - make that encouraged - local biker gangs to bring their bikes inside the main theater, park them along the stage, and on cue, rev their engines. Call me crazy. I hear it often. Mostly for jazz like this. But The Parkway was that kinda place. It fostered insanity, er...creativity. The first time I pulled this stunt was for my big Thrillville Honeymoon Show (actually shows, since we did it twice in one evening) on June 21, 2001. Monica Tiki Goddess and I had just returned from Hawaii after tying the knot at the Cal-Neva Lodge in Tahoe, and we wanted to celebrate in Thrillville, since that's how we initially met. I booked a rare 35mm print of Ted V. Mikels' classic She Devils on Wheels (1968) from The Werepad, and for live entertainment we had legendary local burlesque troupe The Devil-Ettes, along with a Oakland's famous female biker gang The Devil Dolls, who wheeled their hogs through the lobby or via the side theater door, lined them up along the stage, and right before the movie began.....vrrrrooom! Twice. It was such a blast, so to speak, I did it again later for a sold-out Thrillville screening of Easy Rider (1969). I seriously doubt this was legal. Don't expect this experience to be replicated at The New Parkway. At least not by me, anyway. I don't want to push my luck...cheers.